They create novel devices that enable real-time biopsies, light the way for robotic surgery, and help independent-minded teens manage their asthma. They develop new technologies to target the delivery of drug therapies with unprecedented accuracy, to help stroke victims regain their sight, and to vaccinate people with a simple, wearable skin patch that could have global impact. 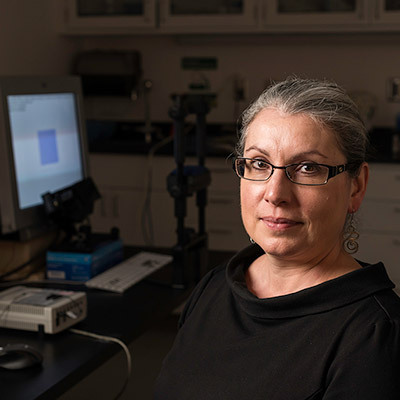 Lisa Beck, Danielle Benoit, Paula Doyle, Hykekyun Rhee, Krystel Huxlin, and Jannick Rolland are among the women inventors who have placed the University of Rochester in an enviable position. According to the World Intellectual Property Organization, Rochester ranked fourth among US universities during 2011–2015 for the percentage of patent holders who are women. A skin patch developed by Beck and her colleagues could one day be used to deliver vaccines without the pain and expense of needles. For patients with vision loss after a stroke or brain injury, a simple therapy device developed by Huxlin could help train the eye to see again. For teens who have lived with asthma their entire lives, Rhee wondered if the gadgets and apps teens love could help them stay on top of their symptoms and take control of their care. The director of the Center of Freeform Optics, Rolland has 35 patents to her name and is listed among the top women pioneers in augmented and virtual reality. And she almost became a dancer. From a childhood spent tinkering in the Maine woods, Benoit is now the author or coauthor of nine approved or pending patents, mostly focused on the targeted delivery of drug therapies. How did Rochester achieve this distinction? What brought these women to the University—and what enabled them to thrive? Conversations with these inventors suggest important benefits to conducting research at Rochester. First, while many other Tier 1 research institutions have their medical campuses and their science and engineering departments across town, or even across the state from one another, at Rochester they’re across the street. That proximity, combined with a collegial atmosphere, encourages collaboration across disciplines. The University has also established programs to support inventors with seed funding and technology transfer assistance. The idea is to encourage risk-taking, building a culture of entrepreneurship in the process. Patents are distinct from trademarks and copyrights. Trademarks protect words, names, symbols, or devices that are used with goods in trade (e.g., as brand names) to indicate the source of the goods and to distinguish them from the goods of others. Copyrights protect “original works of authorship,” including literary, dramatic, musical, artistic, and certain other intellectual works, both published and unpublished. Generally, the term of a new patent is 20 years from the date on which the application for the patent was filed. Regular maintenance fees must be paid at stipulated times to maintain the patent in force. After the patent has expired, anyone may make, use, offer for sale, or sell or import the invention without permission of the patentee, provided that matter covered by other unexpired patents is not used. Where do the royalties go? The Bayh-Dole Act of 1980 transferred ownership of new technologies arising from federally funded research and development (R&D) from the government to universities and other contractors who could then obtain patents and then license the technologies to firms or launch start-up companies. The goal was to make it easier for new technologies to reach the marketplace. Although patenting in US universities occurred prior to the passage of Bayh-Dole Act, it was far from systematic. At Rochester, royalties from licensed technologies are split among the inventors, their departments, their schools, and the University’s Intellectual Property (IP) pool on a sliding scale based on the amount of royalties received. Of the first $50,000 received, for example, 50 percent goes to the inventors, 20 percent to the department, 10 percent to the school or college, and 20 percent to the IP pool. For the next $200,00 in royalties, the split is 40-20-15-25, and above $250,000, it is 35-20-20-25. The distribution is designed to create a “virtuous cycle” in which proceeds from inventions go back into supporting new research. “It’s a great academic environment,” says Doyle, an assistant professor of obstetrics and gynecology. 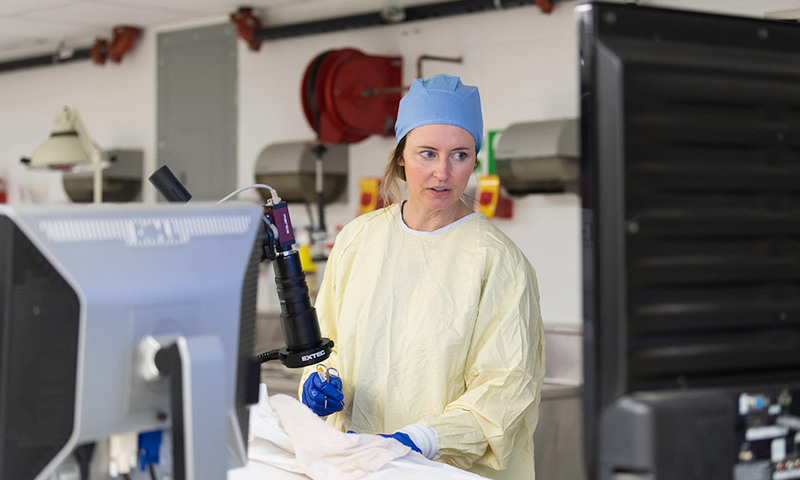 She was still a fellow at the University, frustrated after performing a particularly tricky robotic surgery, when she told a meeting of other fellows and their faculty mentors how nice it would be to “have a flashlight” to further illuminate what she was operating on. “We could do that,” was the immediate response from faculty mentors Ron Wood and Jay Reeder. 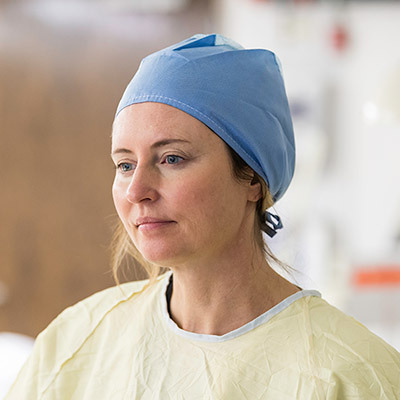 Doyle is now the chief medical officer of Endoglow, a startup that has developed her idea into a disposable device to illuminate internal organs and tissue during robotic surgery. As a member of the Association of American Universities, Rochester is one of the nation’s 60 leading research institutions. The Medical Center—one of 120 academic medical centers in the nation—includes programs in biochemistry, microbiology and immunology, neurology, obstetrics and gynecology, oral biology, and musculoskeletal research that rank in the top 15 in National Institutes of Health funding. That reputation was a big part of what attracted Doyle to Rochester. She initially applied for a residency. She wasn’t accepted, but liked what she saw during her interviews. She then applied, successfully, to do her fellowship here. 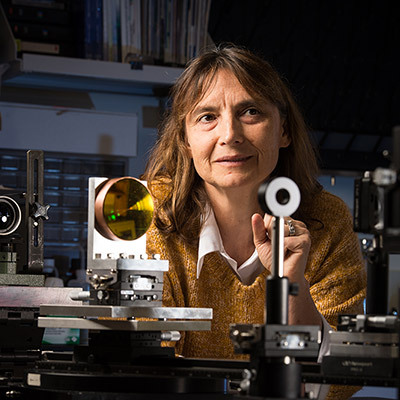 The proximity of the Medical Center to the University’s River Campus was a big draw for Rolland, an optical engineer at the Institute of Optics who has 35 patents and is helping pioneer a new technology as director of the Center for Freeform Optics. That proximity was also a big draw for Benoit, a biomedical engineer at the Hajim School of Engineering and Applied Sciences who joined Rochester hoping to collaborate with medical researchers on targeted drug delivery. That kind of collaboration was difficult while Benoit was working toward her PhD at the University of Colorado campus in Boulder. The university’s medical school was in Denver. “It was really, really hard to develop relationships with people who were 45 minutes away,” she says. At Rochester, 981 feet (about a five-minute walk) is all that separates the Medical Center from Goergen Hall, where Benoit has her office on the River Campus. That’s made it much easier for her to connect with Medical Center researchers in orthopaedics, biomedical genetics, hematology/oncology, and endocrinology. 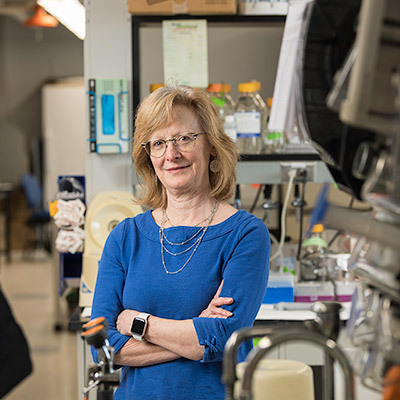 Her collaboration with Edward Puzas, professor of orthopaedics, has resulted in patented technology for the targeted delivery of small molecule drugs to treat a range of bone disorders. Rhee has also benefited from the close proximity of medicine and engineering at Rochester. The professor of nursing researches ways to help teens with chronic asthma. When she wanted to create a device they could wear to monitor their symptoms, Rhee needed engineering help. She was directed to the Center for Future Health, which led to a collaboration with Mark Bocko, Distinguished Professor of Electrical and Computer Engineering, on the River Campus. Together they developed an automated device for asthma management (ADAM), which has since been licensed by a startup called Healthcare Originals. Moreover, Rhee’s frequent trips back and forth across Elmwood Avenue helped her connect with another River Campus researcher—James Allen, a professor of computer science. Rhee and Allen are collaborating on a mobile phone-based asthma self-management device that can “understand” and incorporate the texting language teens use. That interaction is also exemplified in several University research centers that pull together faculty and students from multiple departments. The Center for Visual Science, for example, is a collaboration of nearly 40 labs from seven different departments. “They cover every aspect of vision from optics to computational neuroscience, from genetics to higher level cognition involving vision decision-making. It has been vital to me and my work,” says Huxlin, who has patented a physical therapy approach to helping stroke and injury victims recover their sight. 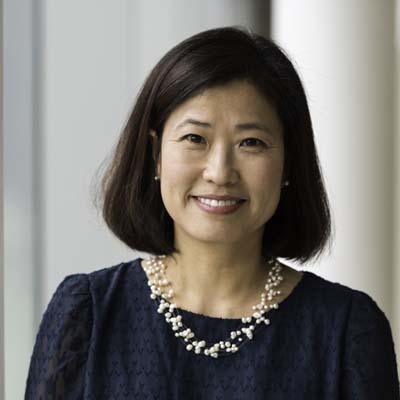 She has also collaborated on a licensed technology that could transform eye care, using femtosecond lasers to “write” vision correction into contact lenses, intraocular lenses, and even directly into the human cornea, noninvasively. There’s also institutional support for researchers interested in developing new technologies. Rhee, for instance, received a Provost’s Multidisciplinary Award from the University to help fund her project with Allen. The awards, given to support promising, high-risk projects, have since been renamed University Research Awards. Last year the University doubled the total funding for the awards from $500,000 to $1 million annually. UR Ventures, the University’s technology transfer office, also provides funding for researchers whose technologies have clear commercial potential, but require further development to interest companies and investors. A UR Ventures Technology Development Fund (TDF) award was the first funding Doyle and her collaborators received. “That’s what really enabled us to get this out of the lab and cover the costs of making some prototypes,” Doyle says. 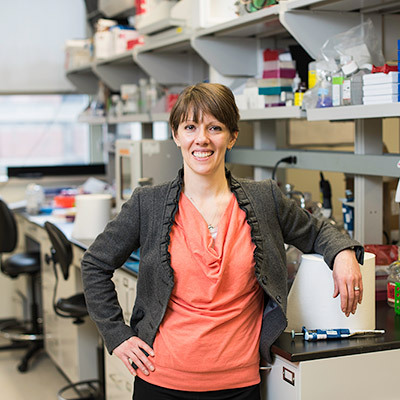 A TDF award also helped Beck and her collaborators accrue more data on the efficacy of the skin patch they’ve developed to deliver vaccines and other drug therapies. UR Ventures was formed five years ago when separate technology transfer offices at the Medical Center and River Campus were combined into one. Under Associate Vice President Scott Catlin, UR Ventures has taken a more proactive approach to patents than was customary in the past. When researchers disclose a new invention, the office makes an initial assessment of its patentability and commercial viability, engaging the inventors and legal counsel in the process, as well as companies, investors, and entrepreneurs whenever possible. UR Ventures then actively supports and promotes those that seem most promising through patent protection, business development, and marketing. Doyle is now immersed in supervising clinic trials and navigating the FDA approval process as the chief medical officer of Endoglow. 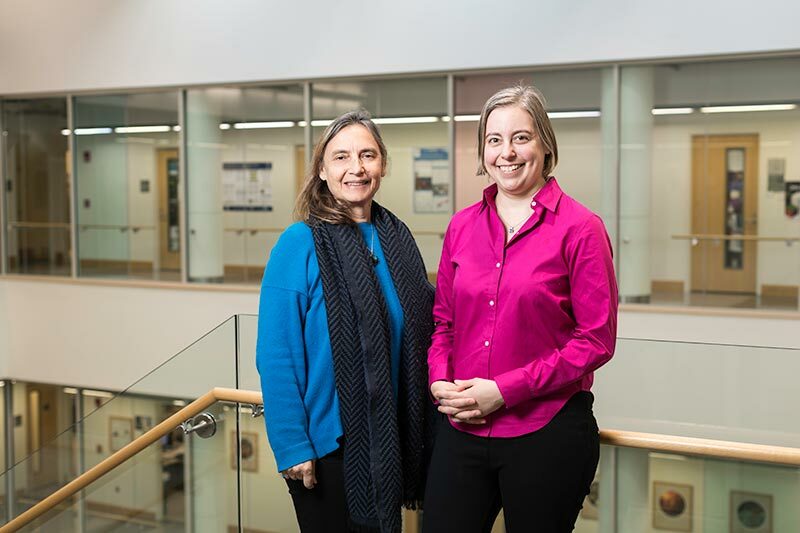 For example, both her department chair Eva Pressman, the Henry A. Thiede Professor of Obstetrics and Gynecology, and immediate supervisor Erin Duecy have allowed her to work part-time as an assistant professor while she helps Endoglow get started. “Without their support I wouldn’t have been able to really pursue this,” Doyle says. In a message on the University’s entrepreneurial mission, he said he was “particularly proud” of the University’s high ranking among institutions with women patent holders. He also noted that the Financial Times of London had recently placed the University’s Simon Business School among the top 10 MBA programs for entrepreneurship in the US and among the top 20 MBAs for entrepreneurship in the world. “Whether it’s the next medical breakthrough, the next patent, or the next sustainable plan to help people in need, entrepreneurism is part of who we are and it consistently informs our educational mission. The University is consistently among the top 65 universities worldwide, and top 50 in the United States, in number of patents granted annually to its researchers. In the fiscal year ending June 30, 2018, intellectual property created by University researchers resulted in 77 patents and 141 invention disclosures. Since 1996, the University has launched 62 high-technology startup firms which have exclusively licensed or optioned technology developed at the University. NextCorps, a University affiliate that is the region’s only federal- and state-designated business incubator, has assisted 100 startup companies both in Rochester and statewide over the last five years with services that include education, mentoring, fundraising assistance, and shared resources. More than 150 alumni and faculty members of the Institute of Optics have started their own companies. Three faculty members—Kevin Parker, the William F. May Professor of Engineering; Wayne Knox; and James Zavislan, the Mercer Brugler Distinguished Teaching Professor—have been named fellows of the National Academy of Inventors, and another, Ching Tang, has been elected to the National Inventors Hall of Fame. The University’s Clinical and Translational Science Institute was one of the first 12 such institutions in the nation to receive NIH funding in 2006 to reduce the time it takes for drugs, medical devices, or therapeutic interventions to get to patients and populations in need. In 2017 the University was awarded $19 million from the National Institutes of Health to coordinate a network of more than 50 such institutions across the country. The University’s Simon Business School last year was ranked among the top 10 MBA programs for entrepreneurship in the US and among the top 20 in the world by Financial Times London. The University’s Ain Center for Entrepreneurship creates partnerships between students, alumni, local companies, and nonprofits; hosts business plan competitions; offers a master of science degree in Technical Entrepreneurship and Management; and offers select students a fifth, tuition-free year of college to launch a project and engage in an experiential pursuit. The University launched the Barbara J. Burger iZone in Rush Rhees Library, a collaborative hub that helps students from all disciplines to explore ideas and solve problems that have a social, cultural, community, or economic impact.